Kettle Moraine Players presentation of “Do Not Go Gentle” – based on a Dylan Thomas poem -- heeds those words. With strong performances, the cast boldly moves through Suzan Zeder’s play with commitment to the challenge. Director Lyle Krueger was assisted by Kerry Miller. The play uses an interesting device throughout to tell this tale. The story is told by Lillian, an 84-year-old woman who has recently died. The year is 1991, on the cusp of Operation Desert Storm. Lillian lived alone, and her family -- a niece, Joanna, as well as Lillian’s Germany-based son, Windsor, a colonel in the Air Force, and teen-aged granddaughter, Kelly—have come to sort through her belongings before an estate sale. Gradually, we learn about the eccentric old woman, beautifully played by Jo Ann Husslein, who comments posthumously and rather humorously about what is taking place in her home. When a discussion of her unweeded, unpruned garden takes place, Lillian’s spirit defends herself by saying, “Who was I to tell a garden what to do!” Husslein has an easygoing delivery as her character’s deceased version subtly, and effectively, inserts herself into the conversations of the living. That’s not to say she isn’t just as wonderful to watch as the very much alive Lillian. The show often goes back in time to explain some of the bizarre occurrences taking place in the present, giving much of the cast an opportunity to transform through time. The walls of Lillian’s home speak volumes about her thoughts. Pictured from left are Abby Reinke, Peter Gibeau, Alexander Frounfelker and Brooke Denman. One of the first curiosities is the preponderance of strange paintings, drawings and words on the walls and other places throughout the home. Flowers are painted on the TV; eyes, and guns and other disturbing images, are found throughout the home. Kelly, who is 13, romps through the house looking for more oddities. “This is like a whole house covered in tattoos,” she says excitedly. But what exactly does it all mean? To learn the meanings of the outrageous graphics, the show flashes back to key moments – when Lillian’s husband died in the war, when her son announced he was joining the military, when her granddaughter railed against yet another move her father’s military career demanded, when a struggling young student serendipitously entered Lillian’s life. It is a well-drawn story that keeps adding surprising layers in the telling. In the end, the show revolves around Lillian’s struggles with the concept of war. “You go to war to make peace?” she asks her son. I truly enjoyed the performance of Husslein, who gives her character a relaxed, kind, sensible nature, really engaging the audience, drawing them into Lillian’s story. She relates well to the other characters, especially her granddaughter, Kelly, a favorite (though the youngster harbored a resentment). Brooke Denman, as Kelly, gives a fine performance, that of a complicated teenager dealing with a lot in her life. Denman is suitably pouty and demanding one moment, bouncy and energized the next. When they find a box of Ding-Dongs in the refrigerator, there is Kelly, clearly stoked, saying, “I didn’t know Grammie ate Ding-Dongs! Cool!” Denman delivers nicely. Peter Gibeau’s Windsor is also well-done, keeping the ramrod-straight appearance of his militarily-attired character throughout with decisive demeanor to match. “I don’t have time for memories now,” he shouts at his cousin when she discovers some photos in a box before the estate sale. He struggles with his relationship with his daughter, who responds with a salute and sarcastic, “Yes, sir!” to his every suggestion. “She treats me like pond scum,” he says. As Joanna, Lillian’s niece, Abbey Reinke fits into the family dynamics well adding another good-fitting piece to this well-told story. Estate sale agent Mildred Flumac (Nichole Reno) is surprised by Kelly (Brooke Denman) as she gets ready for the sale. Alexander Frounfelker , another middle-schooler doing very adult-like work in the show, is marvelous paired with Husslein’s Lillian in Act II, playing a big role in the show’s poignant moments. The former church that houses the Kettle Moraine Playhouse offers a perfect setting for Lillian’s old house with its soaring ceiling and good space for the second-floor balcony. Krueger and Miller’s set design is well-done, though I would have liked to have seen some really old boxes and/or crates – rather than the newish ones – to set the stage a little better. 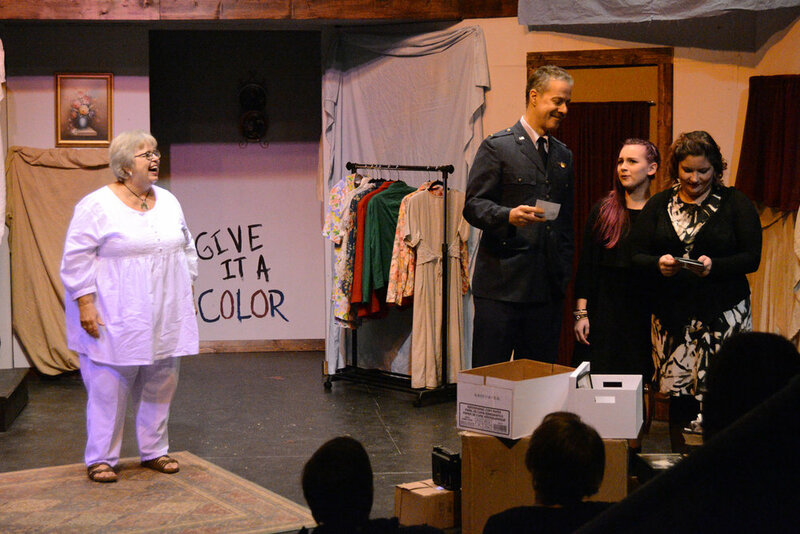 Yet, this show – my first at the Kettle Moraine Playhouse – certainly impressed with the material, as well as its level of performance and staging.